Through its business centers in India, Sun has offered its technical skills and incubation funds to companies that wished to partner with it. Today Sun has successful business partnerships with ICICI for incubation funds, the Department of Energy for electronics, and with LG to develop appliances. Sun is very happy with their ventures in India and plans to exponentially increase the number of employees in their Bangalore engineering center, while setting up new offices in and around India. Lionel Lim, a Sun VP, has stated that Sun is planning on pushing the net economy in India by recruiting more engineers to help with their network programs and devices. Over the last two years, Cisco, the world-famous networking company, has invested over $150 million in building and expanding their technology development enterprise in India. Cisco has also set up their second largest R&D facility in Bangalore, India, which houses over 1,500 Indian technical professionals. Cisco's Bangalore center was developed to help the company deploy fast solutions and products, develop new technologies and successfully meet customer demands. Cisco's future plans include making more investments in India and leveraging the skills of Indian networking professionals. Ford Motor Company (FMC), the renowned American automobile giant, initially only outsourced back office work like accounting to India. As they were pleased with India's high level of quality and reliable services, they also set up a software development center to manage their e-business solutions. John Larson, a director at Ford, has stated that Ford is extremely pleased with the fast and efficient services handled by Indian professionals. In the future, the company wishes to do more business in India. In the last two years, Ford has invested over $5 million into setting up an information technology venture. On a yearly basis, the company is investing a large sum of $30–50 million into the IT venture in India. Ford's IT enterprise in India will handle all the company's IT work from manufacturing bases spread across the world. The Indian center will also meet Ford's e-business solutions. Ford, along with competitors like General Motors and Daimler-Chrysler, have also moved the functioning of their online automotive portal "Covisint" to India. With all of these companies having branches in India, it has been easy to outsource the web development of Covisint to India as well. Efficient web development from India has helped Covisint emerge as a successful portal where buyers can get help with purchasing, compare prices or check out configurations. Apart from outsourcing IT, software development and web development to India, Ford has also moved their entire call center operations to India to get access to 24/7 customer support. Ever since outsourcing began, Oracle has been tapping into India's potential by creating software development enterprises in Hyderabad and Bangalore. Oracle has recently started a consulting center in India that will virtually cater to the consulting requirements of Oracle companies worldwide. Gary Bloom, Oracle's executive vice-president, says the company is more than willing to make a large investment of $200 to $500 million to tap into India's brainpower. Oracle has also opened up an e-business enterprise in the city of Hyderabad, which meets the requirements of Oracle customers worldwide. Initially the Hyderabad center started with only 100 resources, but today Oracle has recruited over 2,000 resources, and this number is only growing. General Electric (GE) has invested close to $130 million in setting up a large, state-of-the-art research and development center in Bangalore, India. This center is GE's 2nd largest R & D center in the world and is staffed with skilled Indian professionals. The Bangalore GE center is equipped with the latest technology and engineering tools. It is responsible for interacting with GE's partners, suppliers, customers, branches and other technology centers across the world. GE also has a technology center in India that currently employs over 2,200 engineers and scientists who have expertise in chemical engineering, mechanical engineering, polymer science and new synthetic materials. Recently, GE has also opened up an e-knowledge center which will disseminate knowledge and technology developments to GE's business centers. 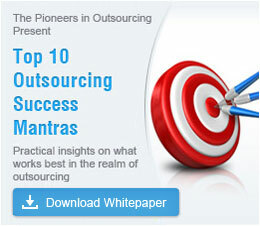 Why choose India for outsourcing? Outsource2india is one of India's most reputed outsourcing service providers, with over 20 years of experience in successfully addressing the requirements of global companies in the US, UK, Australia and the Middle East. No matter the type, nature or size of your business, our services can help you cut down on operating costs, save on effort and provide your customers with 24/7 services. All our centers are equipped with the very best in technology, infrastructure and data security measures. We follow rigorous Quality Assurance standards to ensure that our services adhere to international standards of quality. Our main strength lies in our skilled team of resources who can bring about the successful completion of any project. You can outsource almost any back office business function to us, as we handle everything from customer support, data entry, software development, engineering services, bookkeeping, transcription, medical billing, research and analytics, web analytics, creative design and photo editing, amongst others. Why not try us out today and get a first-hand experience of how outsourcing works? Get in touch with us now and leverage the benefits of outsourcing to India. A look at some of the major areas that outsourcing is proliferating into. Quality matters: a few salient facts. Businesses have been outsourcing their distribution or marketing to third parties for centuries.